This permanent route for ski tourers takes them from the Diavolezza valley station beside or off the piste right up to the top station, covering a vertical distance of about 890 metres. 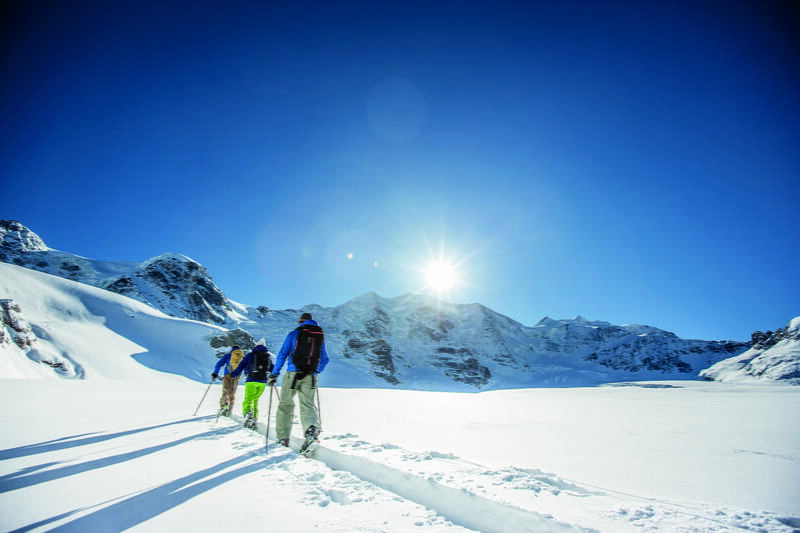 This ground-breaking project provides for the first time a safe and clearly marked way for ski tourers to train. These athletic visitors can hand in their bags at the valley station. When they reach their destination at the top of Diavolezza, their bags will be waiting for them in the Berghaus Diavolezza. Ski tourers are allowed to use the showers at the mountain hut on request (incl. towel and soap). Baggage transport is Included in the price. You are also allowed to take a shower in the Diavolezza mountain hut! The Go Vertical shop at the Diavolezza valley station has a small stock of ski touring equipment. Please check in advance at the main shop in Pontresina.